The Oklahoma State University campus beautification initiative provides energetic and interactive features including plazas and courtyards, outdoor spaces, seasonal displays, public art and landscaping for the community. What an amazing backdrop to host your next event! Meeting & Conference Services staff will be happy to help you think through the logistics of your event design. to help you select the perfect space for your event! For outdoor events, it is important to consider an inclement weather plan. Your contingency plan might comprise of an alternate indoor location, a rain date, or a strategy for cancelling your event. It is also important to advertise a plan ahead of time. 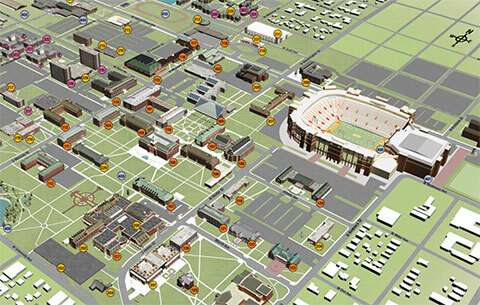 OSU Facilities Management must coordinate all equipment needs (i.e. tables, chairs, trashcans, tents, etc. ), electrical, waste management, and other service requirements where necessary. Allow at least 10 working days for service coordination. Please visit fm.okstate.edu to submit your online work order and to view a list of available services. Tents at outdoor events can provide shade cover, aesthetic appeal, and a "marketplace" or festival look to your events. Tents cannot be left unattended, and must be secured sufficiently to avoid danger. In lieu of stakes, sand bags are an alternative option to help anchor down your tent. Before your event request can be approved, you will need to submit an Okie811 web ticket request and submit a copy of your request to Meeting & Conference Services. In order to respect the rights of the OSU community, all outside events must comply with campus and City of Stillwater noise regulations. Outdoor events with the potential of disturbing neighbors must conclude by 10:00 p.m. In addition to late night sound curfews, it is also important to consider the acoustic impact that your event might have on campus offices, classrooms, and neighbors during the day and evening. Sound must remain at or below the 70 decibel level. 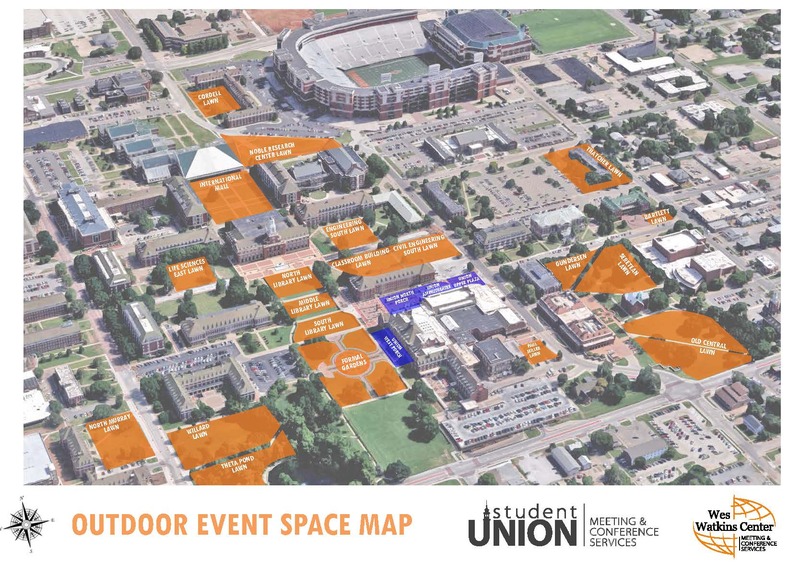 All outdoor events on the OSU campus planning to distribute and/or sell food or beverage will need to complete a Food-on-Campus Waiver Application and submit to Meeting & Conference Services for approval. You may purchase food and beverages directly through Celebrations Catering on campus in lieu of completing the food waiver.